It is sweet. It sustains us. Nature provides. And all we must do is pay attention, and gratefully take what we are given. The bounty of the earth is there for all of us. The blessings of a homestead are many, and one of these is the bounty of fresh harvested food for our table. While our garden is still small, our needs are few. And we supplement with wild forageables from the land on and around our property to fill our plates, our stomachs, and our hearts. Today’s Harvest was meagre, but welcome. Kept inside most of the day by the incessant rain we’ve had here of late, I was able nonetheless to go out and check on the garden for a little while when we had a break in the downpour. There I found a mere three strawberries and three tomatoes waiting for me. But it is! When only two days ago I should have had three strawberries, but got to keep only two (the third had a slug hanging out of it, and was left for the slug to finish and then feed the birds). The tomato plants have struggled between the blessing of the rain and the onset of early summer heat to produce and pollinate. Yet still they provide! And my daughter will gratefully down those three little cherry tomatoes with more joy than most children get from a candy bar these days. Meanwhile the broad beans are blossoming, the zucchini are aflower, and the herb garden continues to grow. A lime bush we thought beyond hope, transplanted in a box from our previous home, has come back with full green leaves and is valiantly winning the struggle to grow anew. Cabbages which had all but dried out from the bright sun a few days ago have found new strength and are thriving in the shade of the straw bale bench. 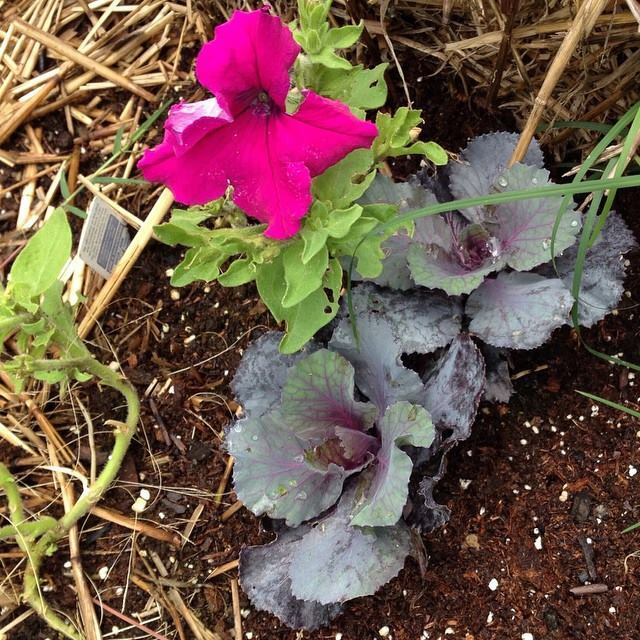 Rescues of begonia and petunia from the discount rack at the big box hardware chain are blossoming in bright abundance at the gate of the garden, putting on a show of reds, purples, and pink to thank us for giving them the chance to live.